Taking her idea, I went with a giant bagel since we were just in NYC, it is fun, and the hole in the middle represents a missing piece to the U.S. foreign policy budget. Dr. Shah wants to squeeze development between the traditional big Ds of U.S. foreign policy, but it is quite a big task when only taking up 4.4$ of the bagel. 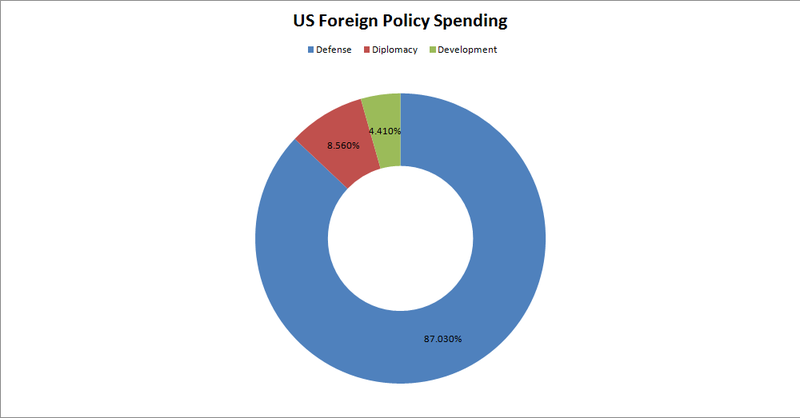 Defense dominates (no surprise there) and the Department of State is roughly twice the size of USAID. Now some military money is used for development, so a few changes could be made to manipulate the numbers a bit, but it all is part of the same cycle. What happens next so that Obama's hopey-changey speech gets translated into actual change in our 50-year-old aid legislation and at USAID and the 25 other government agencies involved in US foreign assistance? Will development really be elevated on par with diplomacy and defense when the White House's new policy says that Shah will report to the Secretary of State, and will have a seat on the National Security Council only "as appropriate"? For his part, Senator Wirth got in comments about energy and climate. When he was asked by Shah what are the development priorities over the next five years, the UN Foundation President stuck to his favorite topics: climate and energy. Naturally he expanded from there, but he made it clear that, "we can't get from here to there without electricity." The literal and figurative meaning of that statement was in full use. He finished by talking bringing in women and environmental diversity to form a 'triangle' of the most important topics. "The theme that runs through [the triangle] is the empowerment of women," he remarked. Women remain an integral part of this week with Shah saying, "We have known for years, investing women and girls is essentially the answer in development." So, lots of good quotes but little in terms of substance. In a week that has been an outward show, Shah and Wirth brought the circus to a new venue and left those wanting to know more without. Despite all of the hype, we still have two Ds with one tiny d sandwiched in-between. Development has become the cream cheese of the U.S. foreign policy bagel. It makes it taste better, but all the real calories are in the bagel itself.